It’s over a year now since we decided to move to Robertson, and I must say I’m thoroughly enjoying the place. The people are lovely, the scenery’s beautiful, it’s great having a decent-sized house and yard, and everything is so easy and laid-back. Just as we’d hoped. One of our concerns, though, was that the winters here are supposed to be pretty cold. “If you make it through the first winter you’ll be all right,” was a common comment from the locals before we moved here. 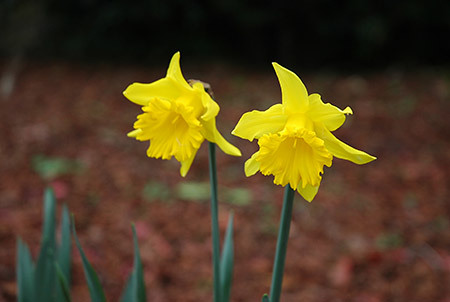 Well we are now over half-way through our first Robertson winter and so far it’s been like an English spring! There have been a couple of frosty mornings and the odd cold wind, but much of the time I’ve been walking around in a T-shirt and sweater (not even a jacket). Also there have been days and days of blue skies with hardly any rain (which of course is bad as well as good). Here’s a pic of our back garden on a typical winter mid-afternoon. 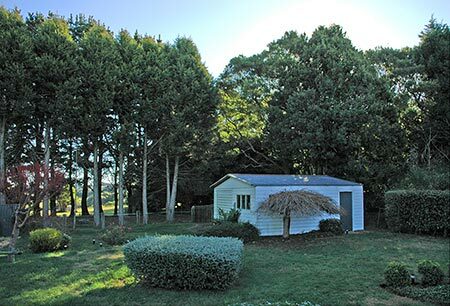 You can see that the sun has gone behind those tall trees (a bit pesky as it puts our garden into shadow). I was actually lying on the deck in the sunshine at lunch time on this day and I got too hot! All very strange. Still I’m not complaining, as I love warm weather! 🙂 Another nice thing is that the days, though shorter than summer, are still longer and brighter than in an English winter. So I think we’re going to cope OK with the winters here. Well after around 3 years of deliberating, evaluating and pontificating – not to mention travelling up and down the east coast countless times – we’ve finally decided where to move to when we leave Sydney: Robertson! In fact we’ve more than just decided – we’ve sold our Northern Beaches unit and bought a house there. Wahey! Where’s Robertson, I hear you ask? It’s a large-ish village in an area south of Sydney called the Southern Highlands, which are 700m above sea level. Other towns in the area include Bowral (the home of Don Bradman), Mittagong, and Moss Vale. We’re planning on leaving Sydney in the next year or so, due to starting a family and needing a 4-bedroom house. But where to move to? The choice is overwhelming. In this series of posts, I explore a plethora of possible places – many of which we’ve visited – in an attempt to reach some sort of conclusion. Next up – Milton. Milton is a charming little village on the New South Wales south coast. It’s about 3 hours’ drive south of Sydney, near the old fishing port of Ulladulla. The general area is holidaymaker territory, with beautiful beaches, swimming inlets, laid-back atmosphere and holiday cabins aplenty. Milton itself has a bit of an alternative vibe, a great vegetarian cafe, 2 semi-decent pubs, live music, a part-time library and a good IGA supermarket. It’s only 6km from Ulladulla for shopping, and close to the sea – in fact, houses with sea views are affordable for us (wow!). Ulladulla itself is an OK but not particularly attractive medium-size coastal town. Mollymook, slightly to the north, has beautiful beaches and the stunning Narrawallee Inlet, which in summer looks like something out of a Bond movie with its deep blue water and sandy beaches. Perfect for swimming. When we first visited Milton we fell in love with the area, and decided it was the place for us. We pooh-poohed the 3 hours’ drive from Sydney, convincing ourselves we’d hardly ever visit the city anyway. So why haven’t we moved there? Well, the area does have its drawbacks. First of all, it’s not just 3 hours’ drive from Sydney, it’s a good 2 hours’ drive from anything even vaguely approaching a city. Now I understand this is fairly normal for rural Australia, but it’s a bit scary coming from the UK – from that perspective, it’s the equivalent of the Outer Hebrides or something. Ulladulla itself isn’t particularly big, or good for shopping. The nearest “big” towns are Nowra (a dump, by all accounts) and Batemans Bay (which again, isn’t great for shopping either). Second – presumably partly due to the lack of anything big nearby – it has the highest unemployment rate in Australia. Not NSW – Australia. I kid you not. I think it’s currently running at over 10 percent. The strange thing is, you wouldn’t know it to look at it. It’s not like there are crack-heads robbing you at gunpoint or beggars on every street. Nonetheless, there’s something about 10 percent unemployment that gives me the willies. Possibly not the best area to raise a family. Finally – and I don’t want to appear ageist – the area is very much a retired person’s thing. The median age is 47, compared with the Australian average of 37. It feels like a place you would retire to (or visit on holiday), rather than a place you’d move to to bring up a young family. But would we move there? Despite these drawbacks, Milton’s a lovely place, the scenery is great, the people are friendly and chilled-out, and it’s close to the beach. So for these reasons, it’s still very much in the running for us. It’s just over a year since the Australian government launched the Do Not Call Register. By adding your name and phone number to this register, you (theoretically) stop telemarketers from cold-calling you. I hate telemarketing calls – they’re a complete waste of my time and energy – so I signed up straight away. The biggest problem, though, has been with charities. For some inexplicable reason, charities were made exempt when the Do Not Call Register Act was introduced. Charities are all to eager to exploit this loophole, too – we get more charities calling us now than ever before. Politics in Australia is best described as a spectator sport, and there’s never a dull moment. From massive U-turns through to practical jokes, jibes, personal insults, bribery, corruption and scandal, Australian politicians make their UK counterparts look like model, if dull, citizens. Take the recent corruption scandal in Wollongong, for example. Wollongong is New South Wales’ third biggest city, about an hour south of Sydney. As a city, it’s a lot less built-up than Sydney – but thanks to alleged bribes, sexual relations between developers and the town planner, and blackmail, lots of rather large buildings are now in Wollongong that perhaps shouldn’t have been built. The corruption is said to run deep, even up to the level of the State Labor government. In fact, Wollongong council was so incompetent that it has now been sacked and put into administration – a story I’m personally familiar with, as our local council, Warringah, has also been in administration for the last 5 years for similar reasons. This seems to be a bit of a trend. 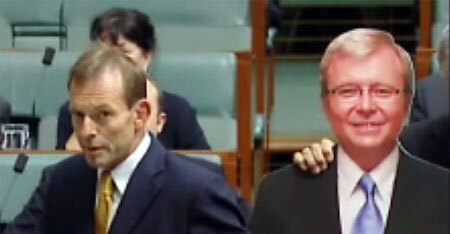 Then there’s the Kevin Rudd cardboard cut-out affair. Pictured above, we see a real Tony Abbott (the MP for Warringah, as it happens) standing shoulder-to-shoulder with a fake Kevin Rudd. Why? It was a protest by Liberal and National MPs about Kev and his mates not turning up to a sitting of backbenchers in the House of Representatives. Obviously in an age of climate change worries, spiralling inflation and interest rate hikes, the most important thing on the political agenda is whether the PM turns up to a sitting or not. We’re planning on leaving Sydney in the next year or so, due to starting a family and needing a 4-bedroom house. But where to move to? The choice is overwhelming. In this series of posts, I explore a plethora of possible places – many of which we’ve visited – in an attempt to reach some sort of conclusion. Next up – the Blue Mountains. 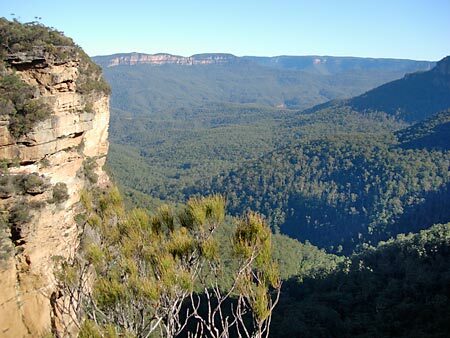 The Blue Mountains is a mountainous (Swiss people would call it “hilly”) area west of Sydney. It’s an area that has always appealed to us, ever since we moved to Australia. It has a winning combination of stunning scenery and lookouts, excellent bushwalking, relaxed atmosphere, and great shopping and dining. Another plus is that it’s big on natural therapies, which is great for my wife’s Bowen Technique and meditation business. Houses are very affordable too. The “Blueys” can be split into the Lower Mountains, and the Upper Mountains. We’re more keen on the Upper Mountains area; it’s further from Sydney, but it has wonderful scenery and it’s cooler in summer. The Lower Mountains area turns into an oven on some summer days. The main towns in the Upper Mountains are Katoomba, Leura, Wentworth Falls, and Blackheath. We’d consider moving to Leura or Blackheath, which are both small, lovely towns. (The biggest town, Katoomba, doesn’t seem as nice, though it has the biggest range of eateries.) When we visit we nearly always stay at Bethany Manor B&B in Leura – a place I can highly recommend for its quiet, laid-back atmosphere, luxurious (and huge!) spa baths, welcoming hosts, and superb breakfasts. The Upper Mountains are generally a bit cooler than Sydney in the summer, and a lot cooler in winter; it can even snow sometimes. I find the cold winters slightly off-putting as I like warm weather. 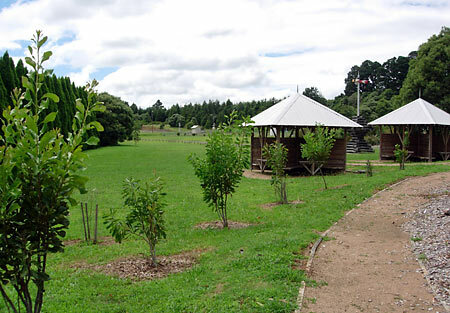 It does mean that the area has four distinct seasons though, with beautiful, European-style trees and gardens. All the main towns are well connected by train to Sydney, though the two hour journey from Sydney Central to Leura is a bit of a slog. As a place to live, the Blue Mountains have two main drawbacks for us. Firstly, they’re a long way from the sea; according to Google Maps, it takes 1 hour 55 minutes to drive from Leura to Bondi (its nearest beach!). Secondly, you get the impression that, as an economic area, it’s not going anywhere; property prices and population have remained practically static the last few years, and there’s not a great deal of new industry springing up. (This is partly due to all the towns being on a ridge, so there’s not a lot of land for agriculture or industry.) Unemployment is fairly high, and there’s not a lot of activities for kids, so it’s possibly not the best place to raise a family. Still, drawbacks aside, the Blueys does look like a nice place to live if you’re after peace and quiet, beautiful scenery, a cooler climate, and a relaxed atmosphere. Now that we have a car, we’re obviously buying a lot of petrol. I have to say, the way they price petrol in Australia is insane. It’s cheap enough – compared to the UK, that is – but you never know what the price is going to be one day to the next. They change the prices every day! At least in the UK if fuel was £1 a litre one day, there was a reasonable chance it’d be £1 a litre the next day. Here in Sydney, it might be $1.29 a litre on Wednesday, $1.40 a litre on Thursday, then back down to $1.35 a litre on Friday! So what gives? According to the Australian Competition and Consumer Commission (ACCC), petrol prices are subject to all sorts of factors, including international wholesale prices and movements in the exchange rate. But do petrol stations really have to change their prices every single day? Just think of the wasted time and effort changing all those signs each morning! (Well it keeps the petrol station owners fit, I guess.) In fact, sometimes they change prices several times a day! Talk about a lottery. Anyway, for the record it appears the best time to buy fuel in Sydney is on a Tuesday, and the worst day of the week is Thursday. So now you know. We’re planning on leaving Sydney in the next year or so, due to starting a family and needing a 4-bedroom house. But where to move to? The choice is overwhelming. In this series of posts, I explore a plethora of possible places – many of which we’ve visited – in an attempt to reach some sort of conclusion. Next up – Jamberoo. We’d spent a long time looking at towns north of Sydney, but nothing really seemed to appeal. So we started searching south. 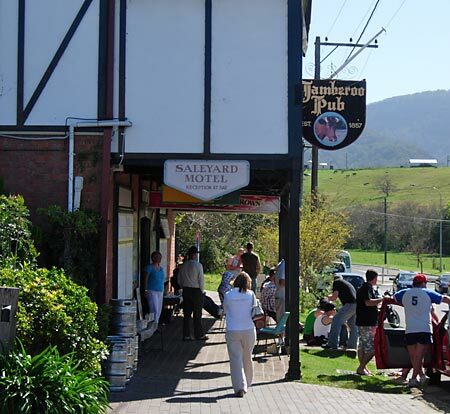 Cat suggested Jamberoo, as it was a pleasant-sounding village in beautiful countryside. It really is a nice place. Small (around 1,000 people), with attractive buildings and a great village atmosphere. It’s only 10 minutes’ drive from Kiama and the sea, and 1 hour 40 minutes from the Harbour Bridge. The countryside is simply stunning, with lush green rolling hills (it’s dairy country), and spectacular views to the escarpment to the west. It’s very English; in fact it even has dry stone walls, which are very rare in Australia. A chap called Thomas Newing brought over the skill from Kent. To add to the English theme, the Jamberoo Pub is a marvellous mock-Tudor affair, with a good atmosphere and a decent selection of beer. A decent pub is certainly one of my priorities! There are lots of great bushwalks in the nearby national parks – another of my priorities – with some wonderful views from lookouts such as Saddleback Mountain. The locals are friendly and laid-back, and the whole village has a relaxed, welcoming feel. And if we ever fancy a Gold-Coast-style break away from it all, the Jamberoo Action Park is just up the road! The only real drawback to Jamberoo is the property prices – you’ll be pushing it to get a 4-bedder under $500k. When we first looked there were a couple around the $450k mark, but we were lucky (or you might say unlucky, since we didn’t buy one of them!). Other more minor concerns are the lack of decent public transport (so one of us would be stranded at home while the other went out in the car), and the quiet nature of the village – there’s really not a lot to see or do in the village itself. We’re planning on leaving Sydney in the next year or so, due to starting a family and needing a 4-bedroom house. But where to move to? The choice is overwhelming. In this series of posts, I explore a plethora of possible places – many of which we’ve visited – in an attempt to reach some sort of conclusion. Next up – Kiama. In theory, Kiama should be the perfect place for us. It’s not too far from our friends and the attractions of Sydney; it’s by the sea, and has some reasonably nice beaches; it’s a decent size. But there’s something about Kiama that doesn’t quite gel for us. It feels very suburban and, indeed, is almost a suburb of Wollongong these days. The shops and cafes don’t seem particularly nice or welcoming, and the town seems to have a bit of a down-at-heel vibe to it somehow. People don’t seem as friendly as they do in many other small towns in New South Wales. It doesn’t seem to have much of a sense of community. Maybe this is just subjective stuff – who knows? On the plus side, Kiama is pleasant enough as a place to visit, with attractions such as the blowhole, feeding pelicans, a lighthouse, and lovely scenery to the west. I’m just not sure it’s the right place for us to settle down.